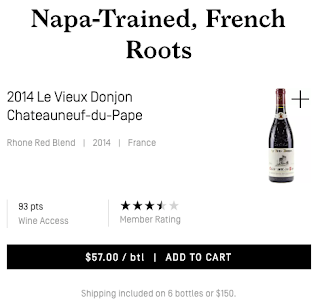 There is an AmEx Offer available now for $60 back on $200 at wineaccess.com. I had a look at their assortment and their prices and I think there's some value to be had here if you're up for getting the specific high quality wines they offer at deep discount. I saw this offer on all but one of my AmEx cards, so it seems widely available. If you have multiple AmEx cards you can load and use the offer for each card. To load the offer to each AmEx card associated with one AmEx login I'd recommend using AmEx's old interface and opening multiple browser tabs, one with each card's offers showing. Then click through each tab and apply the offer to each card. First, I'd go through a shopping portal. To find the best cashback rates use Cashback Monitor. Top Cashback is a reliable portal and they're currently offering 10% cashback at Wine Access. If you're not registered with Top Cashback yet here's my refer-a-friend link. BeFrugal has 13% cashback. Here's my refer-a-friend link for BeFrugal. It could be a bit tricky stacking a shopping portal with the next step, since it's a referral link in itself, but I'd say it's worth at try. The way AmEx Offers work you charge the required amount ($200 in this case) and if the offer has successfully been linked to your account prior to purchase you should receive an email from AmEx right away saying you triggered the offer. The $60 back is processed a few days later as a statement credit. The first thing I ask myself when I see an offer like this is: "Do I want these wines? Are they any good?" Looking at their assortment I'd say they've got a very keen eye for good producers. Take for example the Chateauneuf-du-Pape they've chosen: Le Vieux Donjon. Fantastic producer. Last year when we were visiting the area and only had time to visit a couple wineries this was our first stop. The next question I ask is whether their retail pricing before discounts is fair. They're asking $57 for a bottle of Donjon. For this I use WineSearcher.com to search for the same bottle across other retailers in the country. Looks like their pricing is pretty good. Other retailers are asking more. So our goal would be to land as close to $250 so that after the $50 refer-a-friend discount we should land at $200 and trigger the AmEx Offer. 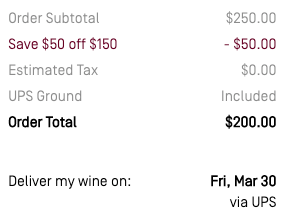 $120 for $250 worth of wine is a 52% discount. Pretty good if you like the wines they're offering. If you've got the offer on multiple AmEx cards you might be able to replicate the deal. Success would hinge on whether you can repeatedly use the refer-a-friend $50 off $200. This would be challenging because that deal is supposed to only apply for new customers. We'll see how that goes. You might consider referring your spouse and/or others close to you to take advantage of the deal. Hopefully I shared some useful tricks in this post. This is a pretty solid opportunity if you're up for buying what they're offering. Some of their domestic Pinot Noirs look appealing to me and their overall assortment looks focused and high quality. If you're looking for a broader assortment this Wine.com offer is ongoing. Question of the Day: Have you done business with Wine Access? Any angles I missed? Any recommendations from their assortment?